Disclosure: Hal Reid has performed several consulting engagements relating to ESRI's BusinessMAP. I have previously written several reviews of BusinessMap (BM 4.0, BM 3.5 and BM Travel Edition 2.0). A common feature of all the versions of BusinessMap is that they have always been bundled with a robust dataset and have been easy to use. However, this version puts BusinessMap in a new league; it is now a full-featured business product. It has a more polished look throughout, including new dialogs, menus and toolbars. In addition, there are new street files, geographic files and demographics, updated Dunn & Bradstreet business listings, new contact manager links to ACT, GoldMine, Outlook/BCM and Excel, and an API with programming examples. This feature is unique to BusinessMap, and is one of those features that makes you say to yourself, "Why didn't I think of that?" Clicking on geographies to add to a selection set is second nature when creating territories. The challenge is to try to balance the territories based on some value such as population, number of customers, etc. The Spatial Calculator uses a wizard to help you do that, and in addition, you can apply mathematical functions to the value you are using which will, for example, allow you to simulate growth. Figure 1 shows my attempt to divide New Mexico into territories around Albuquerque, with about 500,000 people per territory. The counties that make up the territory in yellow are listed in the Spatial Calculator to the right of the map. 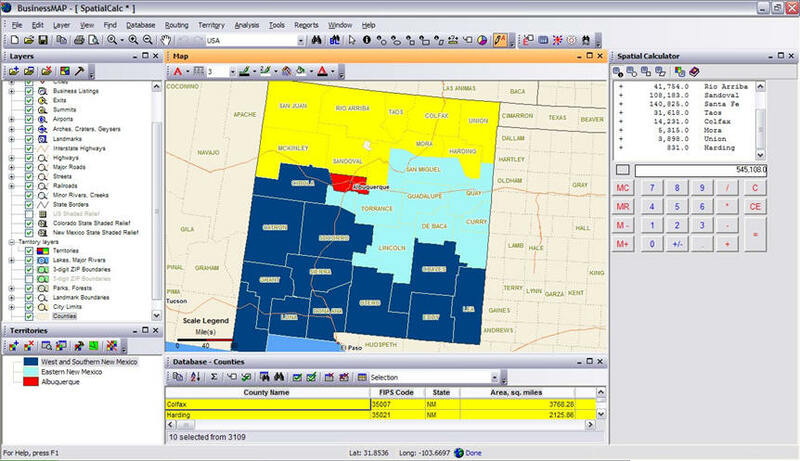 The Spatial Calculator includes tools that allow you to formalize your territories when you finalize your calculations and are happy with the results. This feature is extremely useful in site selection exercises - it helps you find ZIP Codes that are similar to those in which well-performing retail outlets are located. In my Find Similar example, figures 2 and 3, I have located a ZIP Code in Atlanta that contains a very successful hypothetical store. Since the characteristics of this ZIP Code work well for my existing store, I want to find others like it, for expansion planning purposes. Here is my base map identifying my high performing ZIP Code, 30305. The next step is to select the variables for Find Similar to compare. A wizard lets you select up to three variables. I used two, 2006 population and 2011 population, and allowed inclusion of ZIP Codes that were within 20% of those two population figures. These ZIP Codes met the criteria. I would have found this a very useful tool back in my franchise management days - it's a quick way to find some target areas to study more closely in a given market. In retail analysis, you are always trying to tie existing customers to the point of purchase, so you can understand both the extent of your trade area and where you are leaving business on the table. There are a number of techniques you can use to show a trade area, but one of the most visually interesting is the Spider Diagram. The Spider Diagram shows lines from the store to the customer's home. To test the Spider Diagram capability, I split up a database that is part of the sample data in BusinessMap into three parts (Spider 1, 2 and 3). Then I identified a store location for each of the three databases. I stepped through the wizard for each database and created this map. If this was a real presentation of stores and customer locations, you would quickly see the holes where there were no customers, and gain a sense of the trade area of each store. The next step would be to think about where there might be more customers and opportunities for more stores. If you use the Find Similar capability to identify several ZIP Codes you want to analyze more closely, you might want to compare their characteristics. Displaying a chart of desired characteristics right on the map that shows ZIP Codes of interest can be a good start. To try this out, I used the same map of Atlanta that I had used in Find Similar to look at population and population growth in those ZIP Codes of interest. BusinessMap also lets you adjust the size, color and style of the charts. Another valuable feature creates a chart that shows how each geography compares to the other geographies in the selection. This is a basic tool that will let you select the geography to be labeled and modify the font. While this is a very simple feature, it is a very smart way to deal with labels. BusinessMap creates outstanding presentation-quality maps. Using the PDF output capability, you can select the format you want (including EPS), and/or send maps to e-mail addresses. PDF Creator is a free option when you install BusinessMap (sample PDF output). BusinessMap continues to offer great value for businesses. In this version the addition of features like Find Similar, the Spatial Calculator and Spider Diagrams has set it apart from its competitors in this price range. No other product offers the Spatial Calculator. The map output continues to be outstanding, as is the ease of use, especially with the embedded wizards. If you are creating territories, prioritizing markets or looking for sites, BusinessMap is a great tool.